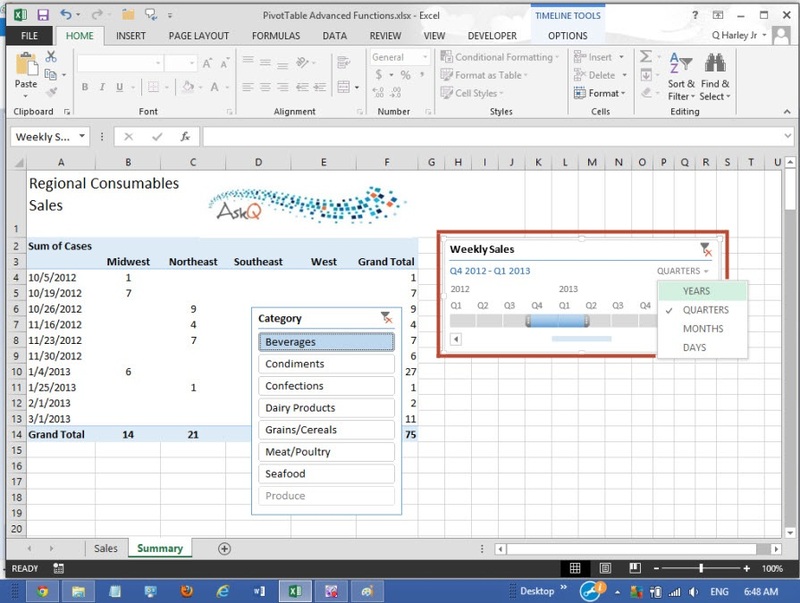 What’s New in Excel 2013? Timeline Slicers ! Timeline Slicers are a feature new to Excel 2013. If your PivotTable contains dates, a Timeline Slicer affords you and your reviewers an easy method to filter and scale of the dates displayed..
Click here to open the file PivotTable Advanced Functions.xls file. Review the Sales sheet. This is the source of our PivotTable data. Click the Summary Sheet. A PivotTable has already been inserted, with the dates of Weekly Sales displayed in Rows, and a Slicer for the Category field applied. Select one of the cells containing data (e.g. A4). On the Ribbon, on the PIVOTTABLE TOOLS: ANALYZE tab, in the Filters group, click Insert Timeline. The Insert Timelines dialog appears. Check Weekly Sales and click OK. The Weekly Sales Timeline Slicer appears. CLICK or CLICK+ DRAG on the timescale to filter timeline. To change the scale, click the Level drop-down, at right, and select Years, Quarters, Months, or Days. To quickly format, select a style from the Timeline Styles on the TIMELINE TOOLS: OPTIONS tab of the Ribbon.